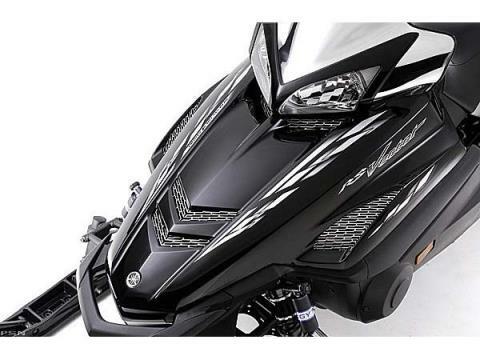 The Sled Legends Are Made Of Like its Vector siblings, the RS Vector GT is powered by the three-cylinder Genesis 120™ four-stroke. Steady, instant-on power and linear torque that pulls so smoothly you have to check the digital speedometer to believe its get-up and went. That performance is backed by a ride-friendly Mono-Shock™ RA rear suspension engineered for ease of maintenance and tuning. Sure-footed on the straights and flat and positive in rutted-out turns. RS Vector GT gets premium GYT-R™ piggyback dual-clicker front shocks and an aggressive graphic treatment. Of course, electric start, reverse, and a DC outlet are standard features. Mono Shock™ RA rear suspensionThe Mono Shock™ RA rear suspension uses a single shock to control the travel of the skid. The shock is remotely adjustable via a rotating dial located conveniently on the left side of the tunnel, near the driver’s leg. The suspension is widely adjustable to suit nearly any rider in nearly any condition. In addition to the remote adjustment, the Mono Shock™ RA is also adjustable at the coil spring and at the control rod. Tall seatThe seat is tall enough to allow riders a clear vantage point to scan the trail in front of them. It also affords added comfort for a long day’s journey. The tall RS Vector seat debuted in 2005. Standard electric startYamaha’s electric starter system allows consumers to fire up their RS Vector GT with the turn of a key. There is no pulling on a nylon cord to get this high tech engine growling! Electric start has been a standard feature on all of Yamaha’s 4-stroke machines, dating back to the original RX-1 in 2003. LCD gauge podThe digital gauge pod on the RS Vector GT allows the driver to see key data at a glance. Either tachometer or speedometer readings can be displayed digitally, with the other appearing on the sweep gauge. The gauge also displays heater settings, fuel level, engine temperature and odometer. Yamaha offered the first digital gauge cluster in 2002 on the SX Viper. Since then, it has become a standard of the industry. The digital readout has been copied by the competition almost across the board. Custom Handlebar BagThe RS Vector GT comes with its own custom handlebar bag for convenient storage. It is factory-build for a perfect fit and integration into the sled as a whole. The custom handlebar bag measures 5.3 inches deep and nearly 8.5 inches across at the opening. That’s large enough to store a hat, trail map and snacks! Second generation front suspension geometryThe geometry of the second generation front suspension features shorter spindles and longer A-arms. The suspension was engineered to deliver greater cornering stability and also more consistent turning effort throughout its travel stroke. 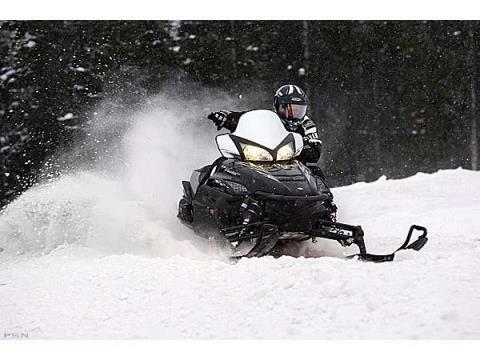 The second generation front suspension geometry debuted on the 2005 Vector-class sleds. It delivers 9 inches of vertical travel and sets the skis at 42.7 inches. Steering is consistent, because the spindles are maintained at a constant 23 degrees. GYT-R™ Premium piggyback reservoir dual-clicker front shocksThe GYT-R™ Premium piggyback shocks on the RS Vector GT’s front suspension offer 20 clicks of compression AND 20 clicks of rebound adjustability for maximum tuning ability. The piggyback reservoir offers increased fade resistance to the shock. Magnesium valve, crankcase and oil pump coversYamaha incorporated liberal usage of ultra-lightweight magnesium material wherever possible to cut weight on engine componentry. The use of magnesium became widespread on all Genesis™-class engines in 2005. Ultra-rigid Deltabox™ chassisThe Deltabox™ chassis is designed specifically to house the Genesis™ engine family. It supports the engine and utilizes it in forming the most rigid chassis on the market. The more rigid the chassis, the more consistent the sled will handle. CF die cast constructionYamaha’s Controlled Flow casting technique is used for many of the structural pieces on the chassis. The CF process draws the molten metal into the mold under a vacuum, eliminating the formation of air bubbles in the material. As a result, pieces can be made much thinner and still deliver the strength characteristics of a conventionally-cast, thicker piece. Yamaha started using the CF process on the 2003 RX-1. Saddleless plastic skisThe saddleless plastic ski reduces unsprung weight and its aggressive keel design provides strong bite to help the RS Vector GT corner. 3-cylinder Genesis 120™ engineThe Genesis 120™ engine is compact and lightweight. Its long stroke and four-valve design produces a tremendous amount of torque for corner-to-corner acceleration on the trail. The broad torque curve is easy for clutch tuners to hit and allows riders to have instant power after backshifting. The three-cylinder engine debuted in 2005. Direct-to-crankshaft clutchingInstead of using a gear reduction, the Genesis 120™ engine has the primary clutch directly attached to the crankshaft. This eliminates parts, complexity and weight, resulting in a better product for consumers. It also allows the engine to be mounted deeper in the chassis to deliver a lower center of gravity, further improving the sled’s cornering stability. The YVXC primary spins at 8500 RPM to transfer power from the engine to the secondary and on to the track. Camoplast Rip Saw™ trackThe Camoplast Rip Saw™ track is a standard feature on the RS Vector GT. It has been widely acclaimed in the industry as the best all around OEM track for acceleration, cornering bite and everyday trail usage. The Rip Saw™ track is the result of a collaborative effort between Yamaha and Camoplast. It first appeared on the 2004 4-stroke models. Rear-exiting exhaustThe exhaust is routed out the back of the sled in order to optimize and maximize airflow through the engine. The tuned system is specifically engineered to produce the Genesis 120™’s broad powerband and also to help keep the sled in balance. Lightweight forged pistonsThe forged pistons used in the Genesis 120™ engine are engineered for lightweight and still allow high compression rates of 11.3:1 on 87 Octane gas. 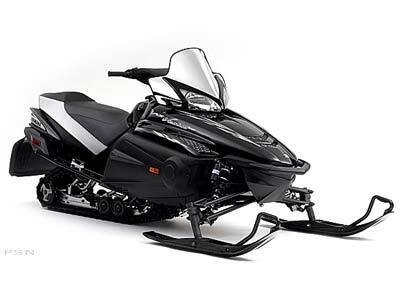 The piston design came out with the Genesis 120™ engine on the 2005 Vector-class sleds.